This is a Chinese name; the family name is Chern (Chen). Shiing-Shen Chern (/tʃɜːrn/; Chinese: 陳省身; pinyin: Chén Xǐngshēn, Mandarin: [tʂʰən.ɕiŋ.ʂən]; October 26, 1911 – December 3, 2004) was a Chinese-American mathematician who made fundamental contributions to differential geometry and topology. He was widely regarded as a leader in geometry and one of the greatest mathematicians of the twentieth century, winning numerous awards and recognition including the Wolf Prize and the inaugural Shaw Prize. Shiing-Shen Chern spent nearly a decade at the University of Chicago before moving to University of California, Berkeley, where he co-founded the world-renowned Mathematical Sciences Research Institute in 1982 and was the institute's founding director. In memory of Shiing-Shen Chern, the International Mathematical Union established the Chern Medal in 2010 to recognize "an individual whose accomplishments warrant the highest level of recognition for outstanding achievements in the field of mathematics". At age 15, Chern entered the Faculty of Sciences of the Nankai University in Tianjin, but had problems at the laboratory, so he studied mathematics, instead. Chern graduated with a Bachelor of Science degree in 1930. At Nankai, Chern's mentor was mathematician Jiang Lifu, and Chern was also heavily influenced by the physicist Rao Yutai, considered to be one of the founding fathers of modern Chinese informatics. Chern went to Beiping (now Beijing) to work at the Tsinghua University Department of Mathematics as a teaching assistant. At the same time he also registered at Tsinghua Graduate School as a student. He studied projective differential geometry under Sun Guangyuan, a University of Chicago-trained geometer and logician who was also from Zhejiang. Sun is another mentor of Chern who is considered a founder of modern Chinese mathematics. In 1932, Chern published his first research article in the Tsing Hua University Journal. In the summer of 1934, Chern graduated from Tsinghua with a master's degree, the first ever master's degree in mathematics issued in China. Yang Chen-Ning's father—Yang Ko-Chuen, another Chicago-trained professor at Tsinghua, but specialising in algebra, also taught Chern. At the same time, Chern was Chen-Ning Yang's teacher of undergraduate maths at Tsinghua. 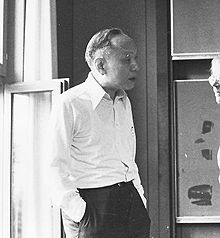 At Tsinghua, Hua Luogeng, also a mathematician, was Chern's colleague and roommate. In 1934, Chern received a scholarship to study in the United States, but he wanted to study under well-known geometer Wilhelm Blaschke. Co-funded by Tsing Hua and the Chinese Foundation of Culture and Education, Chern went to continue his study in mathematics in Germany with a scholarship. Chern studied at the University of Hamburg and worked under Blaschke's guidance first on the geometry of webs then on the Cartan-Kähler theory. He obtained his Dr. rer.nat. (Doctor of Science, which is equivalent to PhD) degree in February, 1936. Blaschke recommended Chern to study in Paris. It was at this time that he had to choose between the career of algebra in Germany under Emil Artin, and the career of geometry in France under Élie-Joseph Cartan. Chern was tempted by what he called the "organizational beauty" of Emil Artin's algebra, but in the end, he decided to go to France in September 1936. He spent one year at the Sorbonne in Paris. In August 1936, Chern watched the Summer Olympics in Berlin together with Hua Luogeng who paid Chern a brief visit. During that time, Hua was studying at the University of Cambridge in Britain. In the summer of 1937, Chern accepted the invitation of Tsing Hua's University and returned to China. He was promoted to professor of mathematics at Tsing Hua. However, in August, the Marco Polo Bridge Incident (near Beijing) happened and the Second Sino-Japanese War started, Tsing Hua was forced to move away from Beijing to west China. Three universities including Peking University, Tsing Hua, and Nankai formed the National Southwestern Associated University (NSAU), and relocated to Kunming, Yunnan province. Chern never reached Beijing. In the same year, Hua Luogeng was promoted to professor of mathematics at Tsinghua. In 1939, Chern married Shih-Ning Cheng, and the couple had two children by the names of Paul and May. Chern returned to Shanghai in 1945 to help found the Institute of Mathematics of the Academia Sinica, which was later moved to Nanking (then-capital of the Republic of China). Chern was the acting president of the institute. Wu Wenjun was Chern's graduate student at the institute. By the end of 1948, Chern returned to the United States because of the Chinese Civil War. He then returned to the IAS. In 1949, Chern became professor of mathematics at the University of Chicago. Coincidentally, Ernest Preston Lane, former Chair at UChicago Department of Mathematics, was the doctoral advisor of Chern's undergraduate mentor at Tsinghua—Sun Guangyuan. Chern moved to the University of California, Berkeley, in 1960. He worked and stayed there until he became an emeritus professor in 1979. In 1961, Chern became a naturalized citizen of the United States. In the same year, he was elected member of the United States National Academy of Sciences. From 2000 to his death, Chern lived in Tianjin, China. Chern died of heart failure at his home in Tianjin in 2004 at age 93.His former residence, Ningyuan (宁园), is still in campus of Nankai University, kept in the way when he was living there. Every year at Dec. 3rd, Ningyuan is open for visitors for memorial of him. His wife, Shih-ning Cheng (Chinese: 鄭士寧; pinyin: Zheng Shining), whom he married in 1939, died in 2000. He also had a daughter, May Chu (Chinese: 陳璞; pinyin: Chen Pu), wife of the physicist Chu Ching-wu, and a son named Paul (pinyin: Chen Bolong). Chern's surname is a common Chinese surname which is now usually spelt Chen. The unusual spelling "Chern" is a transliteration in the old Gwoyeu Romatzyh (GR) romanization for Mandarin Chinese used in the early twentieth-century China. It uses special spelling rules to indicate different tones of Mandarin, which is a tonal language with four tones. The silent r in "Chern" indicates a second-tone syllable, written "Chén" in pinyin but in practice often written by non-Chinese without the tonal mark. In GR the spelling of his given name "Shiing-Shen" indicates a third tone for Shiing and a first tone for Shen, which are equivalent to the syllables "Xǐngshēn" in pinyin. In English, Chern pronounced his name "Churn" (/tʃɜːrn/), and this pronunciation is now universally accepted among English-speaking mathematicians and physicists. ^ a b Nigel Hitchin (2014). "Shiing-Shen Chern 28 October 1911 — 3 December 2004". Biographical Memoirs of Fellows of the Royal Society. doi:10.1098/rsbm.2014.0018. ^ "Chern biography". www-history.mcs.st-and.ac.uk. Retrieved 2017-01-16. ^ "12.06.2004 - Renowned mathematician Shiing-Shen Chern, who revitalized the study of geometry, has died at 93 in Tianjin, China". www.berkeley.edu. Retrieved 2017-01-16. ^ Chang, Kenneth (2004-12-07). "Shiing-Shen Chern, 93, Innovator in New Geometry, Dies". The New York Times. ISSN 0362-4331. Retrieved 2017-01-16. ^ MSRI. "MSRI". www.msri.org. Retrieved 2017-01-16. ^ the_technician. "International Mathematical Union (IMU): Details". www.mathunion.org. Archived from the original on August 25, 2010. Retrieved January 16, 2017. ^ a b "Shiing-Shen Chern" (in Chinese). Jiaxing Culture. Archived from the original on July 25, 2011. Retrieved August 22, 2010. ^ a b c d e Bruno, Leonard C. (2003) . Math and mathematicians : the history of math discoveries around the world. Baker, Lawrence W. Detroit, Mich.: U X L. p. 72. ISBN 0787638137. OCLC 41497065. ^ Chern, S. S.; Tian, G.; Li, Peter, eds. (1996). A mathematician and his mathematical work: selected papers of S. S. Chern. pp. 48–49. ^ a b Bruno, Leonard C. (2003) . Math and mathematicians : the history of math discoveries around the world. Baker, Lawrence W. Detroit, Mich.: U X L. p. 73. ISBN 0787638137. OCLC 41497065. ^ a b c d e f g h Bruno, Leonard C. (2003) . Math and mathematicians : the history of math discoveries around the world. Baker, Lawrence W. Detroit, Mich.: U X L. p. 74. ISBN 0787638137. OCLC 41497065. ^ Bruno, Leonard C. (2003) . Math and mathematicians : the history of math discoveries around the world. Baker, Lawrence W. Detroit, Mich.: U X L. ISBN 0787638137. OCLC 41497065. ^ a b Robert Sanders, Media Relations (December 6, 2004). "Renowned mathematician Shiing-Shen Chern, who revitalized the study of geometry, has died at 93 in Tianjin, China" (shtml). UC, Berkeley. Retrieved Aug 22, 2010. ^ "陳省身 (Shiing-Shen Chern)" (in Chinese). mathland.idv.tw. Retrieved Aug 22, 2010. ^ Bryant, Robert; Freed, Dan (January 2006). "Obituary: Shiing-Shen Chern". Physics Today. 59 (1): 70–72. doi:10.1063/1.2180187. ^ "The IMU Prizes". International Mathematical Union (IMU). Archived from the original on August 18, 2010. Retrieved August 22, 2010. ^ "The Chern Lectures". UC Berkeley Department of Mathematics. Archived from the original on June 7, 2011. Retrieved August 22, 2010. Wikimedia Commons has media related to Shiing-Shen Chern. This page was last edited on 3 April 2019, at 18:46 (UTC).